My students wrote this script for their "robot infomercial." Then they memorized it and performed it together. We have a small stage with a blue screen and fixed video camera in the classroom. CPS Robot can clean, do your homework and even print money! This is a class of only 6 students -- they are some of my youngest. Together we wrote a play based on a book we read in class called "The Great Car Cleanout." The students then made props, memorized their lines and performed together. I saved the best for last! You'll notice the difference in video quality right away. That's because my video editing guru (my husband) shot and edited this video with two of my students. They had a lot of fun putting this together. This project was for a video contest among school's across Korea, and student votes have landed our "DAK 9000" video in 4th place. Now, the judges weigh in...we'll let you know what happens when a winner is announced in late May. For the past two weeks I’ve been consumed by school projects. Recently, Headquarters assigned a required special project. For each class level the requirements were different. My youngest kids had to be in a short musical, which I put together. The next level of students had to write and perform their own short play. My older students scripted and performed a TV Commercial to promote the use of secondhand items. Finally, my oldest students were to invent a robot, decide what skills it would have and then script and perform an infomercial with one student acting as a robot and the other as show host. All of this had to be recorded on video. The best two groups from each class would have their videos submitted to compete against English Academy students across Korea. Yes, this was also a contest! It sounds cute and fun, but does it sound difficult? Well, let me tell you – it was torturous. I was like a woman possessed by these projects. I thought about them all day and literally dreamed about them all night. I scrounged around the house and brought in a giant bag of props for my students to use. My biggest project was creating a robot costume for two classes to wear. I would have preferred my students do this, but no time or supplies were provided. So, after work I was doing arts and crafts. I pushed my kids hard. I wanted them to do well. I wanted them to recognize this was something special and to go above and beyond their usual performances. I set myself up for a bit of disappointment. The memorization required was a challenge. After two weeks some students still didn’t know their lines – and I wanted to pull my hair and their hair out. Korean children can be very reserved. So, having them act silly and dramatic on stage was a battle. And for the little kids, it was a Herculean effort to keep them focused and quiet and get everything right in one continuous video take. Of course, we never did get everything right. That was just this teacher’s silly fantasy. Finally, the big reveal of my robot costume. My students oohhhed and ahhhed – they loved it. And, then they put it on. I had made it much too big. Their eyes were at the slot for the mouth and their arms could hardly reach around the body of the costume. So, as my first group performed, I found myself laughing so hard I was crying. My poor student Terry valiantly tried to remember her lines, while trying to maneuver in this costume. It was then I finally gave up and gave-in. Most of my students were trying hard and I could only control so much – which is to say, not very much. My students were challenged and most rose to the challenge. I managed to get some students excited and excelling outside their comfort zone and that’s good too. So, even if we don’t win the contest, that’s something to celebrate! (We have a stage with a blue screen in class. I am one of those girls who cries over her hair. I’ve had a few really bad hair experiences, but I’ve even cried over the mediocre ones. It’s girly. It’s immature. And I’m sure it will happen again sometime. There, you know the truth. So, I had my hair cut and colored right before I left for Korea. Nearly 10 months later and I hadn’t worked up the nerve to get a haircut. It’s comical. I moved half way around the world and this scared me. You hear horror stories because the stylists don’t speak English or how they dry cut your hair or how they can’t do blond color because that’s simply not an option for Asian hair. 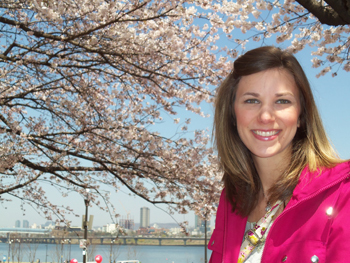 Here’s what happened – my hair started to look bad and eventually ugly hair overcomes fear. So, in a fit of bravery I marched myself over to the salon across the street. I had a piece of paper in hand from a Korean co-worker explaining my need for a haircut and to take off two inches please. It worked. No one spoke English, but soon my hair was being washed and I was on my way. It was also my first time with a male hairdresser, but he was uber-stylish, so I figured I had nothing to worry about. He showed me a picture of a hairstyle and I liked it. So, he went to work. And he cut…and he cut some more. He pulled my hair up and down and sideways and cut. He dried my hair and then cut it some more. He was armed with a literal tool belt of a dozen scissors. I felt giddy in the chair, because no matter what the outcome it was okay. It would be an improvement! And it was...a big improvement. I ended up with a few more layers than I like, because that’s a lot of work to style. However, it’s a good cut. He worked for an hour and styled my hair great. The bill was even better. How about $15 for elegant salon treatment! I’m the girl who cries over her hair, but there were no tears this time! P.S. Any girls in Korea facing the same dilemma -- try "Curl Stage" in Yatap. It's on the bottom floor of the Amigo Building right near Kim's Club! The sign that Korea’s spring is actually, finally, really here…cherry blossoms. The beautiful trees are celebrated throughout the country with festivals, bike tours, and weekend outings. They are simply beautiful. 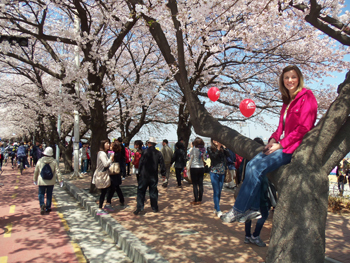 So, this weekend we joined thousands of others in Seoul for the annual Hangang Yeouido Spring Flower Festival. Yeouido is an island typically known as Seoul’s business and financial center. It’s also where the National Assembly meets (equivalent of Congress). 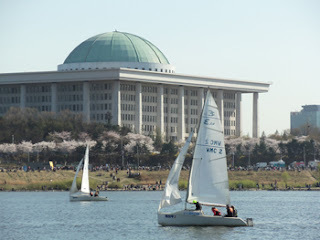 But, Yeouido is also home to more than 12-hundred cherry trees along with green space and great river views. “It’s like the trees are smiling.” That’s how my husband described the cherry blossoms. At least they make us smile! The snowball clusters of pale pink blossoms cover every inch of these trees. It’s a beautiful, fleeting sight that offers a good reason to celebrate each April. So, we walked the island and enjoyed the views. 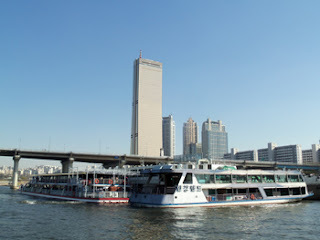 And, then we took a riverboat cruise to see everything from a different angle. We were just basking in the spring sunshine and smiling spring flowers. Early spring is always my favorite time of year. 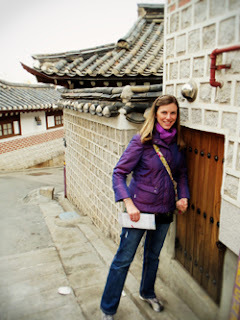 The goal was to get outside – so we followed the advice of a local magazine (Seoul Magazine). They recently started a new column called “Seoul Walks.” I love this idea of exploring small segments of the city on foot. 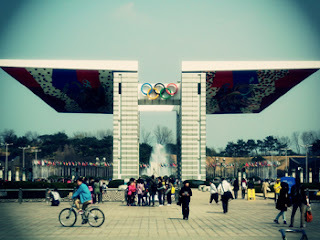 The first walk took us to Olympic Park. Seoul hosted the 1988 Summer Olympics and it was a big success. It was a big morale booster for the entire country, and some say it helped to usher in democracy. 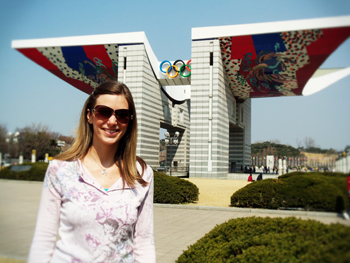 I’ve never been to any Olympic events or an Olympic venue before, so I thought this would be interesting. 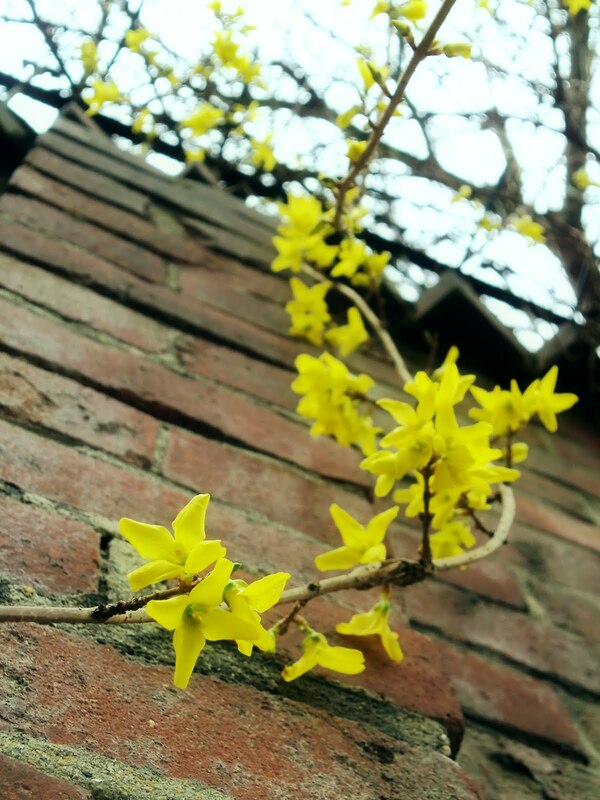 Along the walk to the park, there are little things that catch your attention. Manhole covers painted with Olympic motifs and sculptures leading up to the magnificent Peace Gate at the South Entrance. Underneath the gate, the Olympic torch still burns. 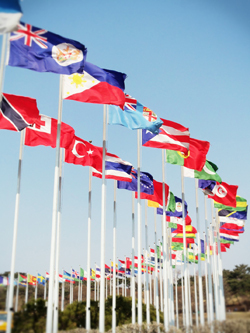 Behind the gate, flags from the 159 countries that competed in 1988 stand in a semi-circle. Being there, it felt like you were stepping back in time. You could imagine everything shiny and new more than twenty years ago. You could imagine the park teeming with fans and athletes from all over the world. Walking through the park, of course you can see a number of the gymnasiums and facilities used for the Olympics, although you can’t go inside. Still, walking the grounds in enjoyable. 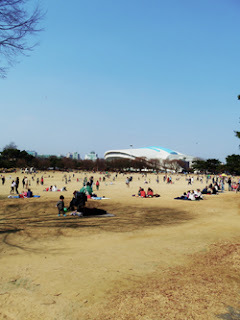 There are large green areas, and that has turned this into a family park. People are flying kits, riding bikes, and kicking soccer balls. There are restaurants and refreshments. It’s simply a good place to get outdoors and get some exercise. There’s also a sculpture garden, and a few museums in the park. I just love exploring Seoul. I love getting outside and at the same time being a tourist and taking in a bit of history. 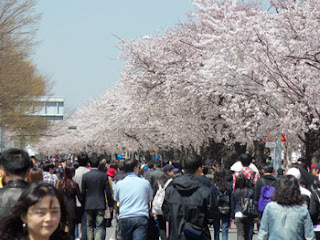 So, we’ll be trying a few more “Seoul Walks.” It really makes for a pleasant day. First, you can take Subway Line 5 (purple) to the Olympic Park station. To enter by the Peace Gate, take subway line 8 (pink) to Mongchontoseong. Leaving Exit #8, you’ll see the giant gate in front of you. Finally, to try the walk as we did it, take Subway Line 2 (green) to Jamsil. Walk out Exit #2 and go straight until you hit Seokchon Lake. First, the walk calls for a leisurely stroll around the lake to your left. You’ll see Lotte World on your right. (The lake really has a pleasant atmosphere) As you reach the end of the lake, take a left and when you hit a major intersection, turn right. You’ll see the Peace Gate in the distance. The single family homes many of us from the States are use to living in are rare in Korea. There are simply too many people and not enough land. In and around Seoul, everything is built up – way up. Apartment living is typical. It wasn’t always that way. 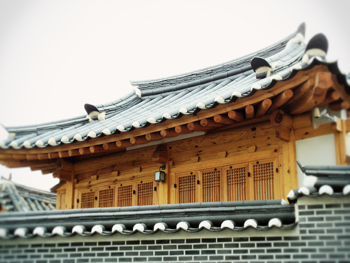 Traditional Korean wooden hanok buildings use to cover the whole country. They were torn down during the economic revolution. Luckily, there’s a small section of Seoul that was spared the wrecking ball. Walking through the alleys of Bukchan-dong you can imagine what all of Seoul once looked like. 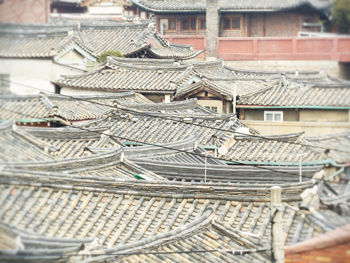 The buildings are beautiful with their wooden craftwork, elaborate doorways, and tiled roofs. It’s the picture of Asia one fantasizes about. These are still residences, and the people living here are mainly descendants of powerful noble families and royal clan members. It just adds to the fantasy…. 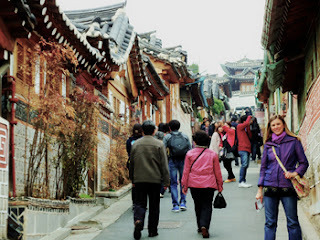 The web of small lanes in Bukchan-dong also gives way to tiny tearooms, bookshops, and art galleries. This is actually where you can experience many of Korea’s traditional arts – like embroidery, hanji (paper-art), and folk painting. Many artists have congregated in this area with showrooms open to the public. In some studios, demonstrations and classes are available. This is also the place to go if you want to spend the night in a traditional hanok. Several hanoks have been transformed into guesthouses. It’s an idea I’m pursing, because it’s the perfect place to spend a weekend! The atmosphere is simply charming. At a leisurely pace, it’s great to walk through the alleys and explore the art galleries. 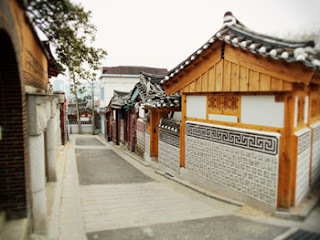 I was surprised to find that one day wasn’t enough to get into all the nooks and crannies of Bukchan-dong. The guide book that sparked my interest in the area simply didn’t do it justice. 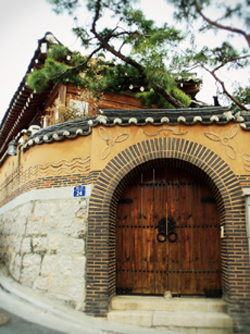 I only wish there was more than one neighborhood in Seoul still full of lovely hanok. Getting to Bukchan-dong: Take subway Line 3 (orange) to Anguk Station. Walk out Exit #3. Walk straight up the main road and then take your first left. 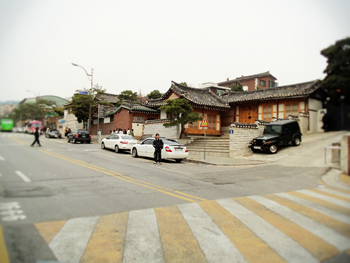 On this road you’ll see the “Bukchon Traditional Culture Center.” Stop there for a look around as well as good maps and information.